A celebration of faith, love, and peace, The FTD Gods Gifts Bouquet is a special way to share in a unique moment on lifes path with your recipient. Pink Asiatic Lilies and pale pink roses weave a captivating light throughout this arrangement, surrounded by lavender chrysanthemums, purple button poms and lavender double lisianthus. 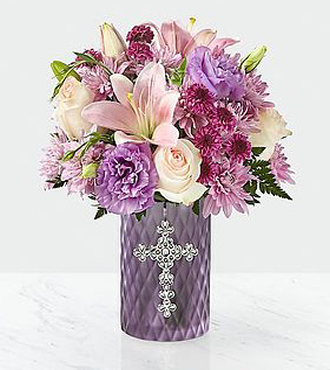 Presented in a keepsake purple glass vase accented with an ornate silver cross on the front, this gorgeous bouquet creates a stunning gift they will simply never forget.